MathJax is one likely cause of slow editing — parsing and rendering math formulas can be kind of slow, and the live preview in the editor triggers a reparse on every keypress. The default renderer here on Crypto.SE seems to be the old "HTML-CSS" renderer, but the MathJax version we have also supports the newer "Common HTML" renderer, which may be somewhat faster and more responsive. You can also try the SVG or MathML renderers, or, for absolute maximum speed, the "PlainSource" renderer, which just shows the unprocessed LaTeX source. Disable fast preview and assistive MML. The same context menu also has two on/off options labeled "Fast Preview" and "Assistive MML". Unchecking both of them should speed up MathJax rendering a bit. Assistive MML is an accessibility feature for visually impaired users with screen readers, and should be 100% safe to uncheck unless you're using one. Fast Preview, on the other hand, is a feature to speed up initial math display, by first pre-rendering all the math on the page with a "quick and dirty" renderer (IIUC, same as "Fast HTML" in the menu) before actually rendering them properly with the chosen renderer. While it makes math appear to render faster, the extra rendering pass actually takes more time overall. Disable MathJax while editing. Robjohn from Math.SE has a couple of bookmarklets to temporarily disable MathJax rendering (and also to enable MathJax in chat, which some folks might find useful). Just follow the instructions on the linked page. 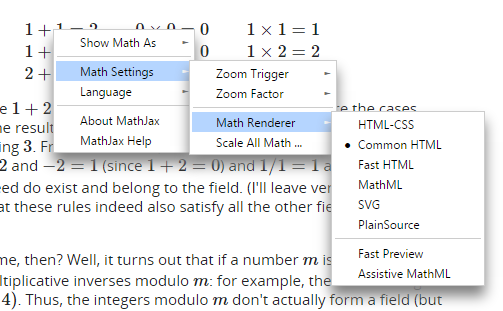 Update: Davide Cervone (one of the MathJax developers) has released a user script that makes MathJax render faster while editing, and also includes a handy "Disable MathJax" checkbox for those times when even the improved MathJax preview is still too slow (basically replacing the bookmarklets by Robjohn mentioned above). I very much recommend installing it. Not the answer you're looking for? Browse other questions tagged support bug feature-request editing stackexchange . Is it possible to disable live rendering of post texts during posting a question?